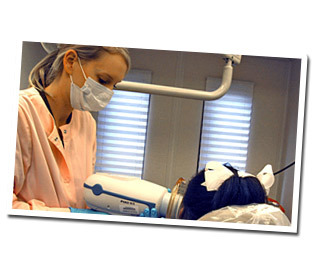 Dental Hygiene is one of the most rapidly expanding professions in the Allied Health field. Dental Hygienists are licensed oral health professionals who focus on preventing and treating oral diseases and promoting overall health. They are graduates of accredited programs in colleges and universities and must pass National and State Board Examinations in order to be licensed. As part of the dental team and working closely with the dentist, the professional roles in dental hygiene include, but are not limited to, those of a clinician, educator, patient advocate, administrator/manager and researcher in private and public health care settings. For more detailed information about the exciting field of Dental Hygiene and employment opportunities, please visit the American Dental Hygienists' Association at adha.org. Students in the ULM Dental Hygiene Program earned 100% pass rate on the National Dental Hygiene Board Examination for the seventh consecutive year. Since 2012, Entergy has donated over $15,000 to the Dental Hygiene Program to support the mobile dental hygiene unit. This mobile unit travels to schools, parish health units and community sites in the Northeast Louisiana area to serve the community's dental hygiene needs.